Offered in conjunction with the ABA accredited Fowler School of Law, the JD/MBA program allows students to earn both the JD and MBA degrees simultaneously. The program is completed full-time in four years, with a savings of one year of study. 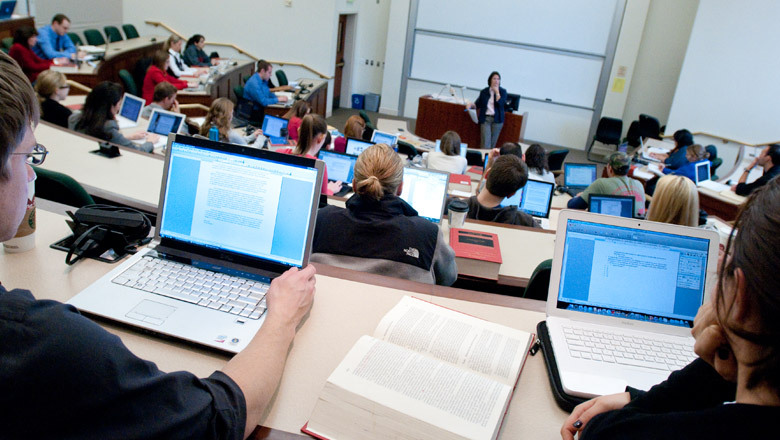 Students typically complete their first year in the Fowler School of Law and their second or third year in the Argyros School of Business and Economics. The final year requires enrollment in both schools. All core JD/MBA courses are taken as a cohort during the day in a consecutive, planned format. Intimate, personalized education from experienced law and business professors who work together collaboratively. Career services and professional development resources in both schools. Community relations and diverse alumni network. Students interested in this joint degree program must submit separate applications and meet application requirements in both the JD and MBA program. Please visit Fowler School of Law for more information about the JD program and application process. *Students must earn a cumulative law GPA of at least 2.6 after completing the first-year law curriculum in order to proceed into the JD/MBA combined curriculum. Tuition and financial aid are primarily handled by the Fowler School of Law. Please visit the Tuition and Fees page for current information. Students may be considered for scholarship awards by both schools. Priority scholarship consideration for the MBA program is granted to students who submit their application early. Please contact the Fowler School of Law Financial Aid Office to discuss how the separate scholarships are disbursed. I'm Hannah Miller. I was born and raised here in Orange County and SoCal is my home. I attended Loyola Marymount University where I majored in Business Marketing and minored in Business Law. I am currently in my third year of the joint JD/MBA program here at Chapman University. I chose to pursue my joint JD/MBA because I eventually want to work in a business role where I can use my legal knowledge to bridge the gap between legal minds and business minds. With the joint degree, I am able to pursue two different but highly related fields that will serve me in any career path that I choose. After my first year of law school, with the help of Chapman’s career service team, I served as a legal intern for a luxury eyewear company. I currently work as a Contracts Analyst at a technology company in Irvine managing their investor relations and client contracts.Being able to apply both my business knowledge and legal knowledge in a company is something that really sets me apart from other candidates when applying to jobs. In my free time, I enjoy playing with my two white labs, watching hockey (go Ducks! ), and playing in a co-ed soccer league with other Chapman Students. Jamil Shaaban is 25 years old, and originally from Palmdale CA. He is in the JD/MBA program offered at Chapman. Jamil will be obtaining his MBA after the Spring 2019 semester, his JD in Spring of 2020, and he is currently a licensed Realtor in Orange County. His goals are to work as a lawyer in the transactional side of law in things such as corporate law, in house counsel, real estate law, or sports and entertainment. Working on his MBA at Chapman had allowed him to not only meet some of the most creative and down to earth individuals, but also immerse himself in the deep network of amazing professionals that can help him achieve his dreams. Outside of his scholarly life, he loves to race motocross, go camping and fishing, workout, and generally be active. Jamil is always open to meet with anyone who might want more information about Chapman, student life, grad school, or anything else. He is super to down to earth and easy to contact so please feel free to reach out! Applications received after the final deadline will be considered on a space available basis.